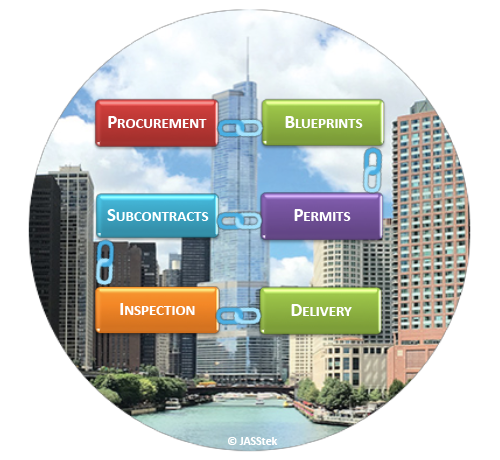 JASStek Blockchain for construction is a private Blockchain that encompasses all phases of distributed ledgers in procurement, blueprints, permits, subcontracts, inspection and delivery phase of building construction. The building owner holds the project wallet releasing funds to various entities on work completions. The entire Blockchain is phased as three major blocks: Procurement, Development and Maintenance. The JASStek Blockchain platform is designed for minimal mining. The data index pointing to actual data is crypto encrypted, to ensure reduced block size. Access is configured by the owner into three key roles per the phases. We are currently working on enhancements to our private blockchain and for it to talk to external vendor Blockchains. This is important as we try to integrate the vast supply chain and vendor ecosystem involved in erecting building project. JASStek’s Blockchain is a step closer to ensuring all ledgers are managed efficiently thru the entire life cycle of a building from cradle to grave. Thru our partnerships, we have successfully implemented multiple Blockchain initiatives across various domains. Contact today, for conversation with Construction Blockchain thought leader, to help you reinvent your business.